It gives me great pleasure to extend a warm welcome to you, Excellency, and the distinguished members of your delegation on your first State Visit to India. Your presence here today, as the democratically elected President of Egypt is particularly significant. It has been now more than 2 years since the historic events at Tahrir Square. We, in India, watched with admiration and respect as the young crowds in Cairo chanted Selmiyya Selmiyya (peacefully, peacefully) and echoed the words of the Father of our Nation, Mahatma Gandhi. Gandhi himself, during India's long freedom struggle, had drawn upon the Egyptian experience in fighting colonialism, and held in high esteem leaders such as Saad Zaghloul. While returning from a Conference in London in 1931, he was prevented from disembarking at Port Said by colonial authorities. He instead issued a message to the Egyptian people wishing them all success in their struggle. As your Excellency is well aware, our historical ties go back much further. Even prior to the Common Era, Emperor Ashoka's edicts record contact with Egypt under Ptolemy II. Traders, artisans and philosophers have crossed the seas time and again to enrich each other's composite cultures. It is really no surprise, that commercial and cultural interactions continue to be at the forefront of our relations. I am happy to note that bilateral trade has increased steadily in the last 5 years, crossing $5 billion, despite the global economic slowdown. Indian companies across diverse sectors continue to invest in Egypt. During your visit a number of agreements have been signed, indicating our extensive cooperation in a variety of fields. Excellency, the future will be determined by the youth of our nations. India and Egypt may be ancient cultures, but our people are young, and their aspirations, hopes and grievances will determine our progress. As we strive to provide greater economic opportunities, and channelize the energies of our youth towards nation building, we recognize that it cannot be business as usual. We must find new ways of engagement within our societies and between our countries. Democracy is incomplete without equity. The yearning for 'bread, social justice and equality' is universal. 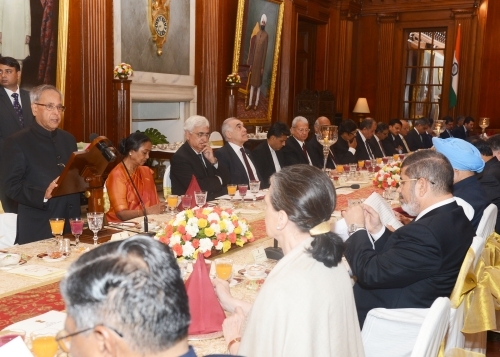 At the international level, Egypt and India have worked together closely, recognizing that in our inter-connected world, threats and opportunities, whether it be climate change, terrorism or trade are truly transnational issues. We are confident of your support and participation in revitalizing South-South cooperation, particularly in the Non-Aligned Movement and in the Group of 77. We seek your active cooperation in building a genuinely representative global order. In the year 1926, the Indian poet and humanist Rabindranath Tagore arrived in Cairo to deliver a lecture. He was hosted at the house of the most celebrated of Arab poets, Ahmed Shawki, where to his surprise, many of the political leaders turned up to greet him, postponing the Parliament session by an hour. Tagore would write of the event in his diary "This was a novel way to show me their respect, a homage paid to knowledge by politics. This was possible only in the East." Tagore was referring to Egypt as a symbol of the East, where under the glory and might of the Arab and Islamic civilization, knowledge and scholarship were celebrated, and freedom of thought and individual rights were respected. Excellency, we are confident that these same values inspire your thought and your action in Egypt, as well as in the larger politics of West Asia, where your sage counsel is so critically needed. We stand with you in our unequivocal support for the legitimate aspirations of the Palestinian people, and look forward to working closely with you in realizing that goal. Excellency, two years ago, the people of Egypt chose to walk the long and difficult path of democracy. I use the metaphor of the road deliberately, since we in India know today, 65 years after independence, that democracy is neither a destination nor an absolute principle. It is more in the nature of a journey, with the steady creation of independent institutions and the careful accretion of compromises, all the while remaining faithful to the essential values of human dignity and freedom. And as much as any journey is made more fulfilling by the presence of companions, we in India stand ready to walk with your great nation as we move from our glorious past to a more perfect future. With these words, Excellency, I once again welcome you and your distinguished delegation and wish you a comfortable stay in India. I am confident that your visit will be the beginning of a new era of enhanced cooperation and closer ties between our two great nations. Please also accept, Excellency, our best wishes for your personal well-being and the progress and prosperity of the friendly people of the Arab Republic of Egypt.